Roseville, CA offers three highly-rated 55+ communities. 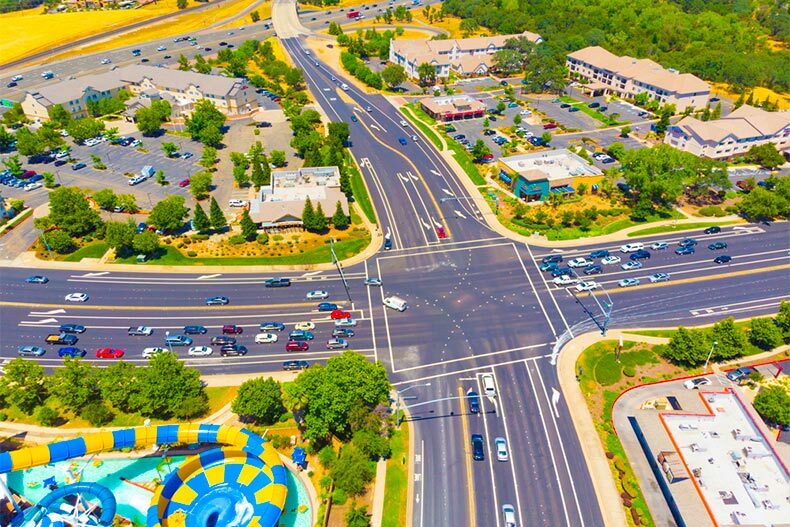 Roseville, CA offers all the charm of a small town with the attractions of a bigger city. The city’s quickly developing downtown center and its access to outdoor recreation add to its appeal for today’s active adults. Roseville’s central location also makes it easy to enjoy all that Northern California has to offer. Discover what makes this city an excellent retirement destination and explore Roseville, CA homes for sale with this short guide. Residents of Roseville enjoy access to prime shopping and entertainment options without the hassles of living in a bigger city. It perfectly blends the tight-knit environment of a small town while offering fantastic amenities. The local area is home to the Fountains of Roseville and Westfield Galleria, which house many luxury retail outlets and high-end shops. Roseville’s downtown area is also undergoing a revitalization, with new shops and eateries always cropping up. When locals want a change of scenery, Roseville’s central location makes it easy to take quick trips to Northern California’s top destinations, such as Sacramento, Napa Valley, and Lake Tahoe. With more than 60 parks and 30 miles of bike trails, residents can enjoy access to civic amenities while exploring the city. And since Roseville is situated at the base of the Sierra Nevada mountains, it offers a gateway to some of the best outdoor recreation in the state. Nearby outdoor attractions include Auburn State Recreation Area and Folsom Lake State Recreation Area. Roseville is also home to a number of championship golf courses, which can be enjoyed year round thanks to the region’s excellent weather. Sun City Roseville offers an exceptional lifestyle for active adults. Mature landscaping and well-maintained grounds contribute to this 55+ community’s relaxing atmosphere. The community is home to 3,110 single-family residences designed for low-maintenance living. These single-story homes are available in many different floor plans and range in size from 878 to over 2,600 square feet. Rich with amenities, Sun City Roseville provides the vibrant lifestyle that Del Webb developments are known for. Residents are served by two separate recreation centers: Timber Creek Recreation Lodge and Sierra Pines Recreation Center. Timber Creek Recreation Lodge offers 52,000 square feet of amenities, including a state-of-the-art fitness center, 25 meter indoor lap pool, restaurant, hobby rooms, a grand ballroom, and more. At 6,200 square feet, the Sierra Pines Recreation Center is the perfect place for community gatherings and celebrations. It consists of several meeting rooms, a catering kitchen, deli, barbecue area, and outdoor activities, such as croquet and a 9-hole golf course. Sun City Roseville also has a separate 18-hole golf course. Additional outdoor amenities include parks and natural spaces, walking and biking tails, a horseshoe pit, and courts for tennis, bocce ball, pickleball, and volleyball. At The Club at WestPark, active adults can enjoy comfortable amenities in a tight-knit atmosphere. This 55+ community is home to just over 700 residences. These thoughtfully designed single-level homes feature stylish interiors, granite kitchen countertops, and other modern touches. Floor plans include two to three bedrooms and up to three bathrooms. The Retreat, which is a 10,000 square-foot clubhouse, brings residents together for socializing and other activities. Residents can exercise with neighbors in the fitness room, pursue their interests at various educational classes, or enjoy live music and dances. Outdoors, residents enjoy access to a pool and spa, bocce ball courts, and a BBQ area. During summer, the community holds outdoor concerts and other events. There is also an onsite concierge service and lifestyle director to help residents make the most of this vibrant community. When it comes to Roseville, CA homes for sale, Heritage Solaire offers a great selection of new builds to choose from. This brand new 55+ community is still being developed, but upon completion, it will be home to 493 single-family residences. With stainless steel appliances and energy efficient features, these finely crafted homes appeal to modern active adults. The floor plans range in size from 1,246 to 2,766 square feet. The planned amenities at Heritage Solaire will ensure residents are never bored. Plans call for a 5,900 square-foot clubhouse called the Sol Centre. This well-appointed recreation center will include an outdoor pool and patio, tennis courts, pickleball courts, bocce ball courts, and beautifully landscaped natural spaces where residents can relax.